Greatly located near to shops and restaurants. Had everything you needed if you just needed to sleep and wash.
Where to find Malta hotels near an airport? 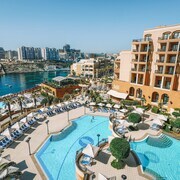 How can I find hotels in different Malta neighborhoods? 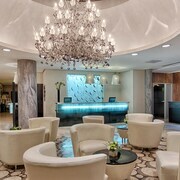 Where can I find hotels in Malta that are near tourist attractions? Malta is one of those spots on the planet you can easily confuse for a hologram of paradise. The Mediterranean Sea surrounds Malta’s ancient temples, daring cliffs, and peaceful villages. Phoenicians, Moors, Romans, Normans, and Spaniards have all sought refuge and victory in Malta’s coves throughout history. In addition, the apostle Paul was shipwrecked here. These days, Malta’s beaches offer a more hospitable landing spot for international travellers. Enjoy luxury hotels and lavish marinas in this glamorous destination. You don’t have to be a big spender to rub elbows with the globe’s rich and famous at a Malta hotel. Expedia.ca. has cheap rates to help you plan a lavish vacation to the Land of Honey on a budget. Malta’s folklore, music, and customs have all been shaped by centuries of outside invaders and deep Catholic roots. Religious festivals, dancing, delicious food, and family ties are all at the core of Malta’s culture. Local architecture borrows from British and Mediterranean influences. Don’t be alarmed when you see rabbit featured prominently on the menus at top restaurants. You’ll walk away from this vacation knowing that the people of Malta love life. You’ll see it in the way they greet you with a kiss on both cheeks. You’ll taste it in the way they prepare Easter desserts with so much passion. You’ll notice it in the way they roar with laughter while jumping in blue Mediterranean waves. Ready to fall in love with life in Malta? Stay right here on Expedia.ca for some very lovable offers. The weather is always fine in Malta. Winters are extremely mild and pleasant. Pack your suitcase to accommodate wintertime temperatures near 20 degrees Celsius. Plan your summer wardrobe to keep cool when temperatures linger around 24 degrees Celsius. In addition to great temperatures, Malta has some of the longest total hours of annual sunshine in all of Europe. 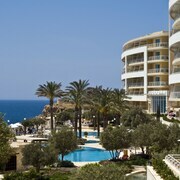 International travellers flock to hotels in Malta for a dose of therapeutic heat and sunshine all year long. Renting a car in Malta is your best bet for getting to extraordinary attractions without hassles. There is an endless array of beaches, bays, and gardens to explore on long drives over heart-stopping cliffs. Design your own tour itinerary with visits to the Mnajdra Temples, Saint John`s Co-Cathedral, Fort Rinella, Grandmaster's Palace, and Palazzo Parisio. Tour Strait Street and Saint George Square in Valletta for a mix of shopping and history. Linger at sidewalk cafes in Balluta Square to savour a caffè latte in enchanted surroundings. No matter how far you roam, we know some great Malta hotels you can return to every night. When you’re ready to plan the ultimate Mediterranean vacation, use our deals to get the best rates on hotels and flights to Malta. It’s easier than ever to use our online booking tools to find deals based on your specific travel dates and budget. Let us help you find great places to stay near beaches or hot nightlife spots. Declare your love for life by planning your holiday in Malta with Expedia. 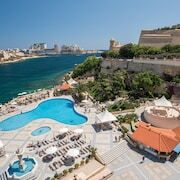 What are the most popular Malta hotels? 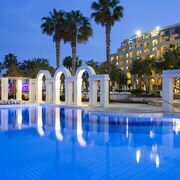 Are there hotels in other cities near Malta? What other types of accommodations are available in Malta? Explore Malta with Expedia.ca’s Travel Guides to find the best flights, cars, holiday packages and more!